Our bulk personalized pen and letter opener sets are composed of a high quality translucent metal ball point pen with matching letter opener in a black presentation box. A classic gift at a low price. Free artwork design. We will send you a proof for your approval before production. 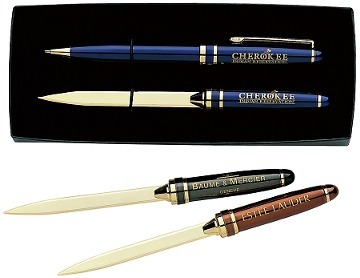 Budget Prices in the USA and Canada for executive-class, deluxe wholesale pen and letter opener sets. American clients pay no taxes. Basic unit price is for 1-color silkscreen imprint on both the pen and the letter opener. Extra colors are not available. Typical Production Time: 7 days after art approval. OPTIONAL LASER ENGRAVING : Add $1.00 per set. Laser Engraving size: maximum 1" x 1/4" on either the cap or barrel (specify location) of pen and on the handle of the letter opener. Colors: we supply 3 models: Translucent Bronze, Translucent Green or Translucent Blue with Gold accents (see photo for all 3 models). Assortment is allowed. Refill: Jumbo metal medium point BLACK ink refill.